Life is too short. Why wait to eat the Cadbury chocolate? A couple of weeks ago, a package from Rowan arrived in the mail. 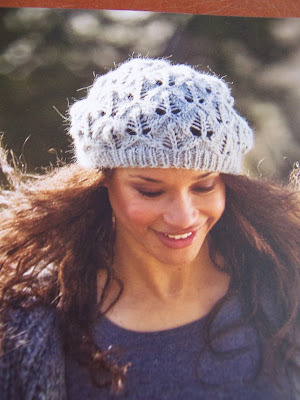 It was the annual free gift of a knitting pattern and yarn for subscribers. 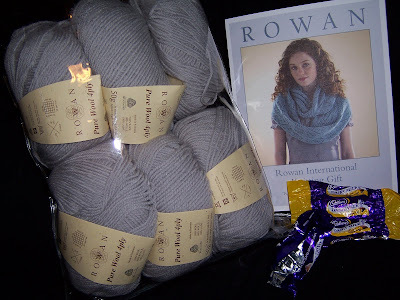 This year it includes 6 balls of Rowan Pure Wool 4ply, along with a scarf and a shawl pattern. I was happy to get anything, but mine was Avocado, a shade of green that I like but which doesn't look good on me. I checked the "Rowan Love" group on Ravelry, and lo and behold, there was a discussion thread already started up by knitters who wanted to swap their gift yarn for other colors. I posted my green yarn and quickly heard back from knitter/blogger Heather, who had received the color Clay. We agreed to swap and I sent off the green yarn. 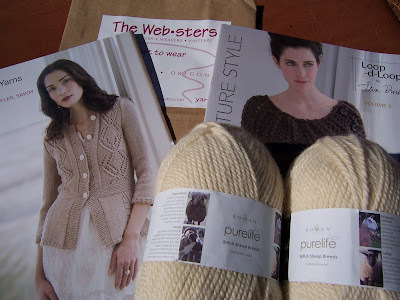 And today, a package of yarn, complete with some Cadbury chocolates and a nice note from Heather, was in my mailbox. What a treat! I am so excited because I like the yarn in the grey color, but it is also light enough to overdye if I decide I want another color later. Thank you so much Heather! ....simply by trying to support another knitting blogger. Some of you may have seen the contest to send a blogger to Antarctica. When I heard about it I went and voted for Eva. She had the creative idea to knit a pair of socks (hopefully during her trip to Antarctica), and give them away to one of the people who voted for her. She did not win the trip. (A man from Portugal received 16,154 votes!) What I didn't know was that Eva is still going to knit the socks. And a couple of days ago I heard from her that I won the knit socks! She chose the yarn and let me choose the color. So in a few months I will be the happy recipient of brand new handknit socks made out of Socks that Rock in the colorway OmaDesala. I've heard great things about Socks that Rock yarn but I've never had the chance to try it out. It is super generous of Eva to go ahead and knit the socks. I'm so excited. Thank you Eva! Meanwhile I am cruising along on the reincarnated sweater out of my silky merino. I will post pics when I am a little further along. Hope you all are having a great weekend. Isn't it much more beautiful now? I have never ripped out an entire project before. I feel like it was almost as big as an accomplishment as if I had finished knitting something. Last week, as planned, I took out the seams and blocked the pieces. I took the trouble to block it because I really was leaning toward reknitting the sleeve caps and putting it back together. However, seeing it blocked clinched the decision to completely frog it. I just wasn't happy with the gauge of the knitted fabric. It seemed like a dreaded chore but once I got going I was excited. It was like getting a gift of brand new yarn! 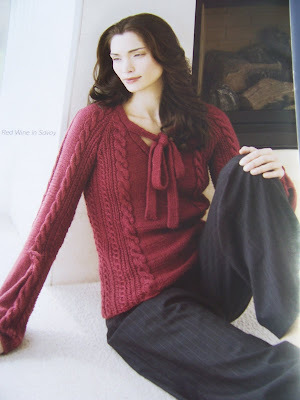 It is the Neck Down Lace Pullover by Cecily Glowik, from the Classic Elite pattern booklet 9091 Alpaca Stories. 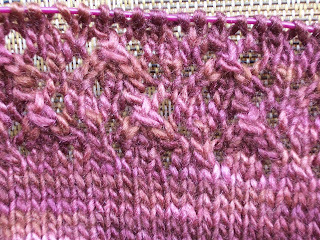 I've knit a gauge swatch and I think I have found a much happier second life for the silky merino. This whole process has been vexing at times, and like anything else that fits that description, I can now look back on it and appreciate the learning process it provided. I really mean it when I say that I appreciate the lessons learned. Still I think I will now go light a candle and say a small prayer to the knitting gods and goddesses that I can get through one project without quite as much of a learning curve. Wish me luck! 2. Receive an email from afghans for Afghans that a last-minute youth clothing drive is on. 3. Discover that you can knit, and watch old episodes of Lost on the Hulu website when your flu symptoms are keeping you up at night. 4. Dig into your stash for some bulky wool that knits up quickly, and peruse The Knitter's Handy Book of Sweater Patterns for an easy and seamless sweater pattern. 5. Start knitting from the bottom up on the Seamless Yoke Sweater. 6. Reach the armholes and discover, even though you knit a gauge swatch and you're following the pattern for your yarn amount, you will not have enough yarn for the sleeves. 7. Alter the plan. Knit a vest! Finally, write about it on your blog so that your friends will know that if they also want to whip up something quickly, you will send it for them along with the vest. Happily, I now have a couple of finishing successes under my knitting/blogging belt, because here is where I tell you about one that not only went wrong, but one which I just kept knitting, even though it wasn't working. I said I would clear this list of items from my queue one way or another before Stitches West. Did I say I reserve the right to frog them as a way of clearing them from the list? It started the previous summer, when I came home from a visit to Portland, Oregon with some beautiful Malabrigo Silky Merino. Like the rest of the Malabrigo yarns it is soft and lovely, and I wanted to knit something simple with it so the rich color, and not a stitch pattern, would be the focus. I thought I had the perfect pattern, as I had been wanting to make this T-Shirt Sweater(scroll down). 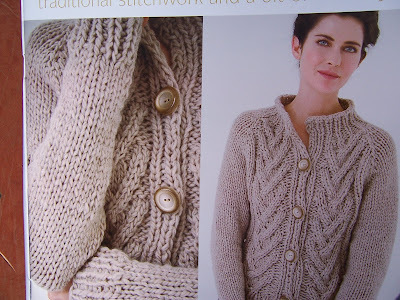 I loved this when I saw it, not so much the color and variegation of the yarn, but the style of the sweater. It is just like a lot of my clothes that I throw on to do errands, etc. I thought how nice it would be for an everyday kind of item to be made out of beautiful yarn so I would get more use and appreciation out of it. I didn't have time to work on it right away, but along came a week during the winter, when for one reason or another I had some free time. I must have been desperate to knit some plain ole' stockinette and watch some movies or something. 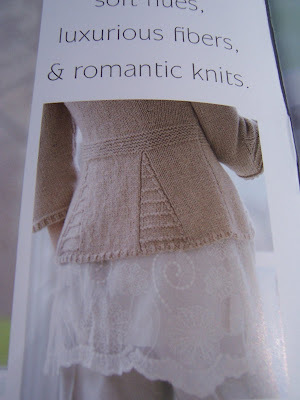 And there I was with a pattern I wanted to knit, and some yarn I wanted to knit. I don't know what else I was thinking, probably not much thinking at all was going on in fact. Unless it was just wishful thinking, because I cast on, and kept knitting, the entire sweater, without ever realizing that I was using DK weight yarn for a pattern that called for worsted weight yarn. The error of my ways did not stop there. I followed the directions to knit the body of the sweater, and then I followed the directions to knit the sleeves. 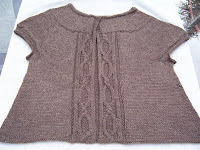 Then, when I was knitting the sleeve caps, I decided, on the fly, to veer from the directions, and make the shoulders of the sweater a little roomier by lengthening the sleeve caps. I didn't give a second thought to the fact that the sleeve caps have to match the armholes of the body of the sweater. I didn't realize what I had done until I was almost done sewing the sweater together and figured out that the pieces weren't fitting together! So, literally, with about 2% of the work on the sweater left to go, I realized that it probably wasn't a good idea from the start. I am going easy on myself. Even though it was a pretty big screw-up, at the time it was the first sweater pattern with set-in sleeves I had followed. I am happy to be working through this list of items that need to be finished, and, even if it's a little late, learning the lessons they offer. What now? The T-shirt Sweater is still sitting exactly in the state I left it, almost done but not working out. I hadn't even blocked it before I started the seams. So I think the first step, whether it is to be fixed or ripped out, is to undo the seams. Then I will block part of it to make a final decision about whether or not the fabric, which was created with DK yarn, makes the sweater worth the trouble of fixing the sleeves. If I like the fabric once it is washed and blocked, I will rip out the sleeve caps and reknit them. If not, I will frog the whole thing and find something else to make with the yarn. Any opinions out there? Fix it or frog it? If frogged, what should I knit next?